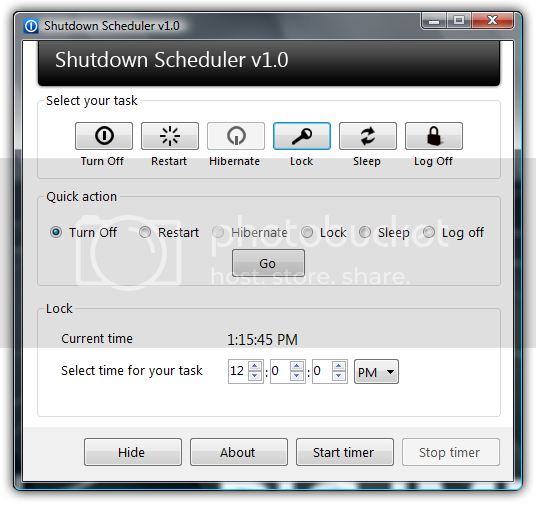 Shutdown Scheduler is a small utility to automate shutdown task. This is the program in which we can specify the given task and give the time, at what time that the task will be executed. This is very useful utility by which we can easily automate our computer. As above mentioned this program is used to automate shutdown task. This program provides six shutdown tasks to schedule for next 24 Hrs. Turn Off, Restart, Hibernate, Lock Your Computer, Sleep and Log Off. This program also provides a Quick Action Section in which we can perform the entire task which are given above instantly. This utility (Shutdown Scheduler) has been developed by Ganesh (Our respected member of MeraWindows.Com), So all credits goes to him. Knew of WinOFF and some other ways, but didnt know of THIS utility. Download links for this not working... Any way to get a copy of this? Cant seem to get the download link for this one.